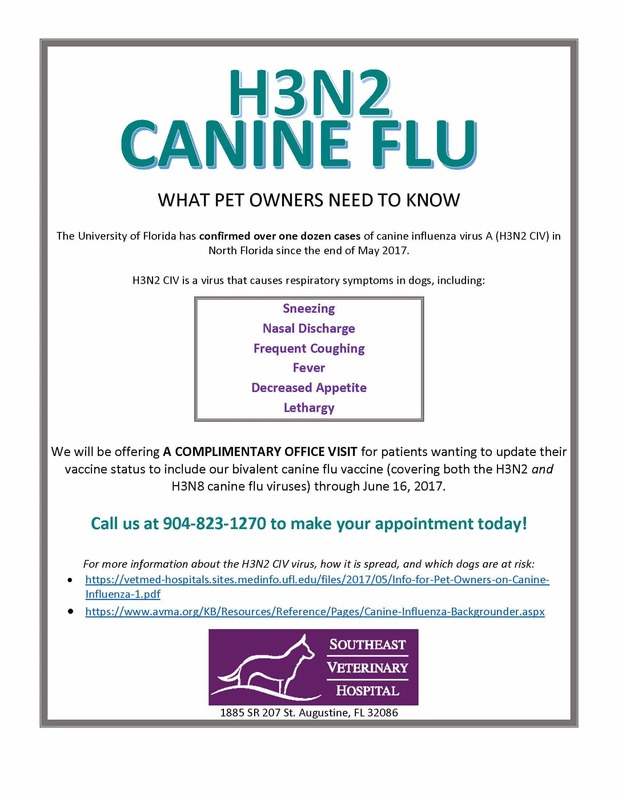 The University of Florida has confirmed over one dozen cases of canine influenza virus A (H3N2 CIV) in North Florida since the end of May 2017. As a result of this, we will be offering A COMPLIMENTARY OFFICE VISIT for patients wanting to update their vaccine status to include our bivalent canine flu vaccine (covering both the H3N2 and H3N8 canine flu viruses) through June 16, 2017. Read more below, or click to download the full PDF. Give us a call, come in for a visit, or use the form below to contact us online and we will get in touch with you soon! If it is during business hours, or if your matter is urgent, please contact us by phone and do NOT use the form below! If your matter is urgent, please call us at (904) 823-1270 and do not use the form below! If by "Referral" or "Other", how did you hear about us, or who referred you?